This is, in my rather eccentric view of these matters, the beginnings of twentieth century abstract art, or at least the beginning of what I find interesting in twentieth century abstract art. (1) See Desiderius Lenz: The Aesthetic of Beuron and Other Writings, Francis Boutle publishers, London, 2002. There are several things to be observed straight away about this painting, marking a startling contrast to almost everything else that was being done at the time, especially in the field of religious art. 1) It is flat. 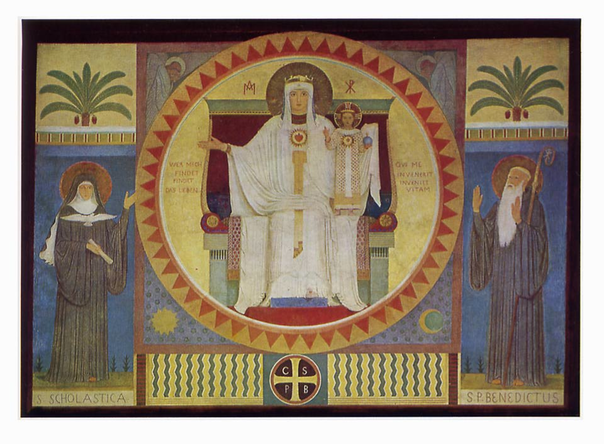 There is no attempt at creating the illusion of a third dimension (unless we pedantically remark the three quarters view of the figure of St Benedict). 2) It is painted for the most part in bright primary colours. There is no suggestion of chiaroscuro or of an illusory light source. 3) It is based on an arrangement of elementary geometrical shapes - rectangles and a circle. This 'abstract' geometry determines the figuration. 4) The figures are 'hieratic' - there is no attempt to convey any sort of strong human emotion. (2) Wilhelm Worringer: Abstraction and empathy - a contribution to the psychology of style, Chicago, Elephant paperbacks, 1997. 1st German publication 1908. 1st publication in English, 1953. I discuss Worringer and his influence on the English theorist T.E.Hulme in an article in the 'Art and Religion' section of this website - Vorticism - Abstraction and Empathy. In this book, Worringer discusses two possible functions of art. The word 'empathy' evokes a feeling of ease with and sympathetic interest in the appearances of the world. He uses it to refer to an essentially representational art, an art of landscape, of the human figure, based on copying models. Abstraction on the other hand reflects, in Worringer's understanding, a suspicion of the appearances of the world. Worringer wasn't talking about a purely non-representational art - he was sufficiently of his age to believe that such an art could not be serious. But in 'abstraction' as he understands it the representation is bound to conform to a schema conceived according to a non-representational, probably geometrical, idea. For Worringer this was not just a matter of a choice artists might be free to make. It was an expression of the state of mind of the age. Empathy was essentially what we might call a 'pagan' art. If it was religious it worshipped human-like gods with human-like emotions who could be found in the beauties of the natural world. Abstraction was the art of societies who saw divine reality as transcendent to, and in a state of tension with, the natural world. We will note the similarity between these two conceptions of 'abstract art' and also the fact that they are both looking to the past. We are not in the realm of the 'shock of the new', the desire to do things that had never been done before. Lenz saw the origin of his abstract art as lying in mathematical proportions used in Egyptian art prior to the Hellenistic period and subsequently, in his view, adopted in Greek classical art. Its antiquity was a guarantee of its truth. Worringer was writing not at all as a theorist of 'modern art' but as an art historian anxious to establish that a non-naturalist art should be judged on its own terms not, as was too often the case at the time, as evidence of an inability to rise to the heights of naturalism.